IIM Indore’s alumna Anupama Sharma (Fellow Programme in Management (FPM)-Batch 2010) received the Best Research Paper Award (Second Runner Up) at the 4th Conference of the Indian Academy of Management. 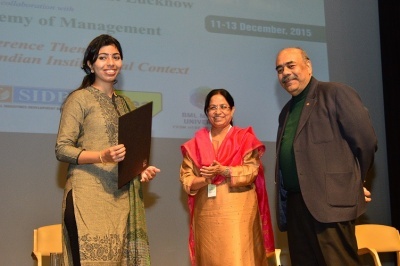 The conference was held at Noida Campus of IIM Lucknow on December 11-13, 2015 and was attended by over 300 delegates. Competing with over 400 research papers, Anupama’s paper titled Work Engagement: A Framework to Analyze Micro Level Individual Outcomes won the Second Runner Up position for the Best Research Paper Award. She also received 25,000 INR as the prize money. Anupama’s paper tries to test empirically the relationships among work engagement outcomes. This study proposes that engagement will result into proactive and inventive behavior such as job crafting and innovativeness. In particular, this study provides theory-based empirical evidence regarding whether engaged employees get involved in outcome behavior that have not been examined earlier. This discussion will contribute to improving the understanding of work engagement. A discussion on research limitations and future research will help in identifying the new directions and extend the research. Anupama is currently working at Tata Institute of Social Sciences, Hyderabad as an Assistant Professor.